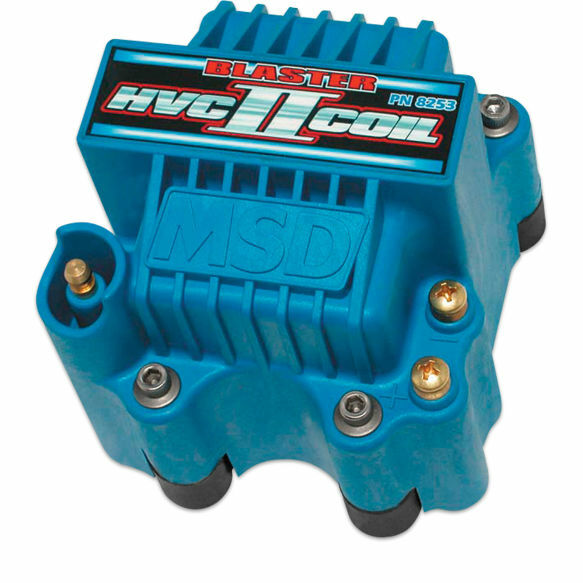 The Blaster HVC coil utilizes an iron U-Core design with a segmented bobbin for improved voltage distribution. The bobbin is molded from a special Dupont Rynite material and wound specifically to produce the most current possible with incredible voltage and lightning quick rise time. The blue housing is also molded from high dielectric Rynite material. The brass primary terminals are spaced far apart and the secondary tower is well protected for increased spark isolation. The housing is completely potted with an epoxy compound for vibration resistance and installs with sturdy vibration mounts.